The nine-month-old controversy over President Trump’s lease for the federally-owned Old Post Office that is now a luxury hotel continues to dog the General Services Administration under its changed and temporary leadership. On Wednesday, House Democrats re-routed the agenda of a Transportation and Infrastructure Subcommittee hearing on property disposal to highlight their new staff report challenging the legality and propriety of Trump’s continued lease of the downtown Washington hotel that is doing a buzzing business hosting foreign officials and functions for U.S. political and advocacy groups. They also introduced a “resolution of inquiry” demanding GSA’s release of internal documents leading up to its decision in March to permit Trump’s lease arrangement. “President Trump continues to directly benefit from the Trump International Hotel, in violation of the lease agreement,” said the report initiated by Ranking Member Rep. Peter Defazio, D-Ore., and Hank Johnson, D-Ga., both on the panel’s Economic Development, Public Buildings and Emergency Management Subcommittee. 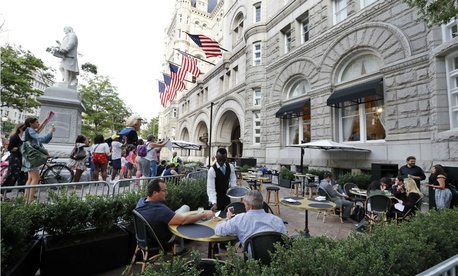 The Democrats argued that the GSA officer who made the decision, Kevin Terry of the Public Buildings Service, relied on a provision in the revised operating agreement for the hotel that the hotel would not make any distribution to any other entity in which Trump holds an interest. “However,” the report argued, “in his most recent financial disclosure, President Trump has reported that he has received $20 million in income from the Trump Old Post Office LLC. In addition, there is evidence that the contracting officer prejudged this case,” claiming the conflict-of-interest issues “nonsense.” What’s more, the sitting commissioner of the Public Buildings Service, Norman Dong, was eased out before the final decision in favor of keeping Trump’s lease was made. Subcommittee Chairman Chairman Lou Barletta, R-Pa., had called the hearing to discuss the newly enacted Federal Assets Sale and Transfer Act to speed up sales of unneeded federal properties. He wanted to discuss an empty Veterans Affairs Department building in Pittsburgh. During the discussion, he inserted op-eds in the record defending Trump's arrangement against conflict-of-interest charges, even invoking George Washington as model. He watched as acting GSA chief Tim Horne, a career GSA staffer with decades of experience who guided the Trump transition working with the Obama administration White House, declined to engage with the Democrats on the constitutional debate. “My role is to make sure the agency is administrating the lease, and as far as I know that clause is not in the lease,” Horne said, adding that he had never communicated with Kushner or Ivanka Trump. He did express regret that his underling Terry had used ill-advised phrasing in an email about meeting with Trump staff. DeFazio complained that his inquiries to GSA for months have produced only partial or non-answers, and numerous other Democrats have lodged complaints about a Trump administration directive that appears to require agencies to deal only with the majority Republicans on congressional committees. The documents being sought include all guidance or direction to the acting administrator or other GSA staff regarding responses to requests for information from members of Congress and ranking members of committees; all documents associated with the Old Post Office lease agreement between the government and the Trump Organization (including annual statements, budgets, mortgage agreements, and claims); and all legal memoranda or opinions regarding the lease agreement. Another witness to the Transportation subcommittee that day was George W. Bush White House ethics specialist Richard Painter, whose written testimony on the new law controlling selling off of buildings included several references to the conflicts of interest in Trump’s Washington hotel lease. Painter is also assisting Citizens for Responsibility and Ethics in Washington in a lawsuit challenging Trump's hotel lease. At a separate hearing on GSA acquisition reforms on the same day on the House Oversight and Government Reform Committee, complaints arose both about GSA transparency issues and its implementation of an acquisitions management restructuring without input from Congress. Subcommittee Ranking Member Robin Kelly, D-Ill., said in December, “members of the Oversight Committee sent a request pursuant to the Seven Member rule to GSA,” defining the rule as requiring “an executive branch agency to provide any requested information by any seven members of the Oversight Committee. GSA provided the documents responsive to the request within two weeks – and we thank you,” she said. Two similar requests, however, sent in recent months, have drawn no replies. Neither Dong nor former GSA Administrator Denise Turner Roth responded to requests for comment. But Dan Tangherlini, who preceded Roth as the head of GSA and now runs a company called Seamless Docs Federal, told Government Executive he believes Roth arrived at her decision not to challenge Trump’s hotel lease using “the right and honorable process. One of the great things about our democracy is respect for the rule of law and contracts, regardless of the politics of the people entering into the contract,” he said.